Listen to "Power Down" on your iOS and Android device. Introducing a major new thriller writer-in the vein of Vince Flynn and Brad Thor-and an electrifying character, Dewey Andreas. A major North American hydroelectric dam is blown up and the largest off-shore oil field in this hemisphere is destroyed in a brutal, coordinated terrorist attack. But there was one factor that the terrorists didn't take into account when they struck the Capitana platform off the coast of Colombia-slaughtering much of the crew and blowing up the platform-and that was the Capitana crew chief Dewey Andreas. Dewey, former Army Ranger and Delta, survives the attack, rescuing as many of his men as possible. But the battle has just begun. While the intelligence and law enforcement agencies scramble to untangle these events and find the people responsible, the mysterious figure of Alexander Fortuna-an agent embedded into the highest levels of American society and business-sets into play the second stage of these long-planned attacks. The only fly in the ointment is Dewey Andreas-who is using all his long-dormant skills to fight his way off the platform, then out of Colombia and back to the U.S., following the trail of terrorists and operatives sent to stop him. 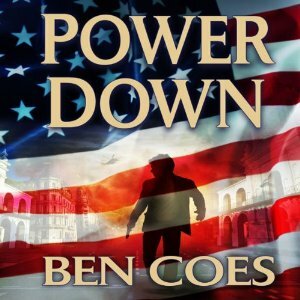 Power Down is a gripping, compelling debut thriller from Ben Coes, a powerful new author, an amazing talent certain to join the ranks of the genre's finest writers. I am a fan of the genre, and this one was refreshingly different. The main character is awesome (par for the course), but the bad guys were smart, and the other characters were also done well. This wasn\'t a one man army kind of deal. The main character knows when he is outnumbered, and he knows when he is in danger. He knows when to run and when to fight. The story seemed more realistic to me than a lot of the books in this genre. The bad guys cause a lot of trouble, and the good guys can\'t miraculously stop them in their tracks like we see in most books. I am super excited to see what happens in the next book. Hopefully some of the side characters are in it as well. Side note: There are a few parts of the book that had me in a state of \"unbelief\", but for the most part, this book is really good top to bottom. The narration for this one was good as well. This book was exciting from the very beginning. I could not stop listening to it! I would highly recommend it. The narrator was great too! Narrator had quite a job to do with all the different characters and accents. Well done!